I don’t know if anyone else every gets HelloFresh, but some weeks there are two meals I really want to try and just kind of picked a last one. This was the last one haha. I was a little hesitant because of the sausage and I mean, who really likes spinach all that much? What got me was that is was tortellini…I love my carbs! This really was a speedy meal. There wasn’t much cutting needed to be done, pretty much one pot besides for the pot with boiling water. The chicken sausage was sweet but savory. The ravioli was the perfect blend of ricotta and spinach. The sauce was to die for! It was light and creamy, and I found myself slurping it up at the end. I was extremely close to giving this dish five stars. The only downfall is that I felt that there could’ve been a few more raviolis per plate. Like every other meal it seems, the scallions appeared. Surprisingly, they’re starting to grow on me. I was that girl who used to pick them out of every dish. This is definitely something I would order again! Those of you that know me, know that I love most seafood and will most likely choose that over any other kind of meat. This was a fairly simple dish to make. The green beans are as simple as adding some water in a bowl, saran wrap over the top, and poking a few holes while cooking in the microwave. They used to come in these bags and you just placed them in the microwave, which was super convenient so I’m not sure why they resorted to this process except money-saving. The first thing I would like all viewers to notice when looking at the difference in photographs is the color of the rice. The recipe calls for adding soy sauce to the jasmin ginger rice. Please tell me how the white doesn’t change color when a dark sauce is mixed with it?! Second, to me, the picture of their tilapia looks baked and not cooked in a pan. So, as you can see, I rated this a whopping five stars and it is well-deserved based on the flavor. I mean, a recipe that has me wanting more of the pesto (which has majority scallions when I don’t like scallions) is an A+ in my book. One thing to note that I did for the pesto was I accidentally added 1 TBS of sugar instead of one TSP, but I think I actually preferred my way. It was the perfect helping of meat, carbs, and veggies. Especially around Lent, this was perfect. I figured out one trick to plating softshell tacos when you don’t have that fancy holder thingy! You can use a wide bowl as seen above. One thing I really like about HelloFresh is the option to have 20-minute meals. For someone like me, always on the go and had multiple events scheduled at the same time, convenience is a big factor. Probably the most time-consuming factor was chopping, dicing, and slicing all of the fresh ingredients. After that, it’s a piece of cake! I was in such a hurry and accidentally did something wrong, but no worries, it didn’t ruin the meal. Instead of squeezing the lime into the sour cream, I added it to the salsa. One thing that was really unique was draining the beef juices and replacing them with the leftover pineapple juice. I was a little hesitant at first because I am a savory person, but this meal was delicious and really well put together. No to mention, there was an excess of beef. Overall, this was enjoyable…it didn’t leave me wanting more, but rather satisfied. This is the perfect Lenten dish for those of you who are Catholics like me! I don’t believe I’ve ever had couscous before this meal. And I’m amazed at the ease with which it is made. Put some water, stock, and the couscous in a pot and voilà! The green beans come in a microwavable bag, so that step is simple. The fish is the only semi-difficult task in the whole meal. The key, I found, this being my second time attempting this meal, was to let the fish cook longer than I expected. Otherwise, you could have one of two problems or both: 1. the fish falls apart or 2. some of the breading comes off. On to taste…the fish remains moist from the mayonnaise. The southwest blend seasoning mixed with the panko breadcrumbs creates a light crust on the tilapia that is tasteful. 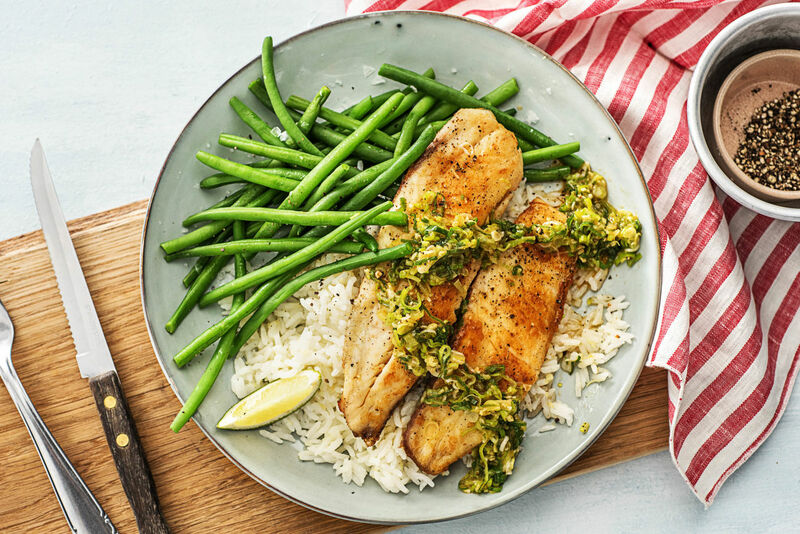 The light and flakiness of the fish mixed with a forkful of green beans and salty couscous is the perfect combination of flavor and bite. Just as a precaution to everyone, this is one of the Premium meals, so it is an additional $10. If I were to rate the difficulty of the preparation, I would rate it as being extremely easy and not time consuming. Pretty much all there was to be done was cutting the fingerling potatoes in half, dicing the tomatoes, slicing the scallions, grating the garlic and lemon zest, and cutting the meyer lemon in half. And finally, mixing the ingredient for the aioli. We will start with my least favorite and end with the most delicious piece. So, as some of you know, I am not a fan of the fingerling potatoes. I don’t care what you do to them, they will always be bland to me. The aioli sauce was made specifically to be drizzled over these potatoes and I absolutely hated it! I’d rather eat the potatoes plain and simple than with the sauce. Next comes the arugula salad with lemon zest and juice, tomatoes, and a drizzle of olive oil. I think, perhaps, that my favorite salads tend to be the simplest ones. This was tart and quenching all the same. It had the perfect balance. And finally (drumroll, please), the crab cakes. I was skeptical because I’ve had some amazing crab cakes in my day. The crab meat was succulent, it was perfectly spiced to not overpower the natural sweetness of the crab. I had to stop myself from eating them all in one sitting. Overall, the reason for only three stars was due to my distaste for the fingerling potatoes and aioli sauce. Honestly, I never want to taste that again. Also, I felt like the portion was for an appetizer more than a meal, especially since $10 extra was added onto my price. The only reason I would order this meal again is for the crab cakes, otherwise, I could see myself not choosing this again. This meal had a lot of firsts for me. First meal I ordered to include mushrooms (I didn’t know that at the time). I think this was the first time I have ever eaten a radish. First time I ever ate pork in a taco. Preparing the meal…I don’t eat fungus, so I did not include these in my preparation. While cooking the meat, I used ALL of the soy sauce. Me likey! For the drizzle sauce to top off the taco, I used all of the hoisin sauce. I’ve decided that Hoisin Sauce is my new favorite as now I’ve experienced it in a few different meals. I can’t get enough of it! What was a nicely added bonus was that the red cabbage was already shredded for us. This was a very tasty dish. I thought it would be a little bland because of the red cabbage, seeing as it is generally used as a filler ingredient. The bitter radish paired nicely with the salty pork and sweet hoisin sauce. I would eat this again! So, I waited until my second time trying this dish before blogging about it. Let me just say, I can’t get enough of it. In order to get a full five stars in my eyes, I have to be able to think about eating that dish every day for the rest of my life and be okay with it. And I could totally eat this dish three times a day every day! I love shrimp and seafood for the most part (mostly because they barely have any fat on them haha). I used all of the hoisin sauce to coat the shrimp. I’m starting to love jasmine rice now that I’ve been introduced to it a few times. The ginger pairs well with every part of the dish in a subtle way. The timing of the preparation of every segment of the dish is perfect. Everything is cooked to perfection and you’re not waiting around or taking to long on certain steps. My brother and his fiance also tried this meal and loved it! This is a plate I would recommend to anyone!